Should Obi-Wan defeat Darth Vader? Can Q beat Mr. Spock? You decide! 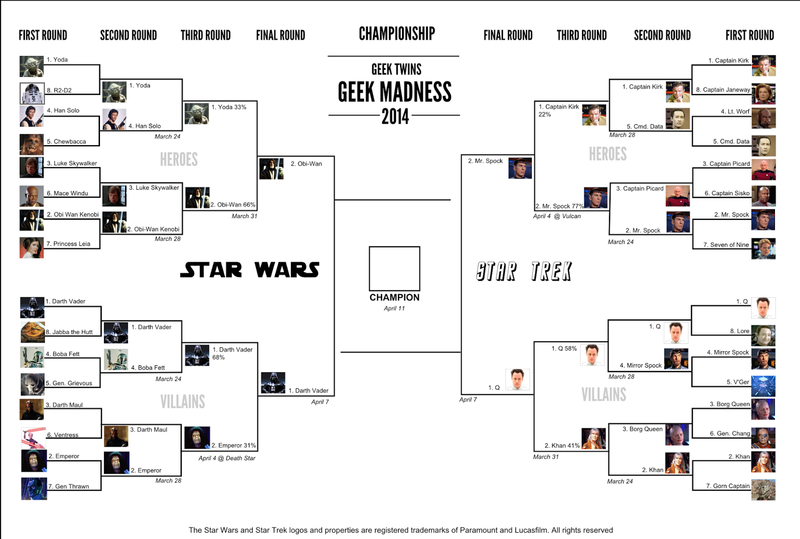 Act now to vote on who goes to the championship in the March "Geek Madness" Star Trek vs. Star Wars tournament! Welcome to the second annual March Geek Madness Tournament! It's time for the final two match-ups before the championship match. Remember to read this Geek Madness post for all the details on the tournament. Feel free to say what YOU think happened in the comments. The best play-by-play of the winning match will be used in the next post! Vote now before you forget! Q's got an IQ of 2005! Oh goodness the voting is close! Spock. Vader. And I know who I'm voting for in the finals. It's coming down to the wire!